Maxi dress from Monki, sweater from Bershka. This is the first time I ever wore a maxi-dress. What do you think? And this is more or less what my night looked like; I didn't bring my 'real camera' but I threw together some clips from my phone and pocketcam. Did any of you go/are any of you planning to go to other Soulwaxmas nights? "For my graduation project i decided to spend a month travelling through scandinavia. i did not plan anything, and spent most of my nights on the couches of friendly people i met along the way. during my stay i took pictures, kept a diary, collected things, and recorded sounds. when i arrived back home, i started making small etchings about my trip. i noticed most of my work was about 'feeling at home'. what caught my attention was that i could feel at home in so many places. even if i was alone, eating an apple next to a glacier. i started to ask myself a lot of questions. what is home? why do you feel at home somewhere? could something help you feel at home when you're far away? my final work was an amulet and talisman, offering you safety and luck. 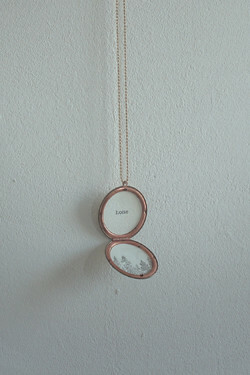 on one side of the antique locket you can find one of my etchings, made after places where i felt at home. on the other side i can write a special message for your loved ones. 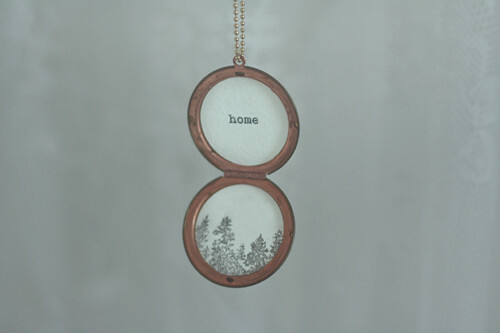 it is a take-away reminder of home, close to your heart." 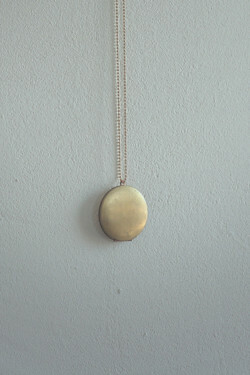 You can order your own necklace made to your specifications from Lisanne's shop. Also, you can follow her blog! Primark coat and shoes, Monki sweater/dress. This morning I woke up and it was snowing! Winter is really here now. That means I have to start dressing appropriatly for winter! I have TONS of coats, but I didn't have one with a hood. So when I was at the freshly opened Primark in Hoofddorp this week, I had to buy this coat to protect myself from snow-inflicted hairdisasters. Tonight I'm going to the Soulwax-party in Eindhoven, so if any of you are going: keep an eye out for me, say hi, don't be shy! Two years ago today we kissed for the very first time. I'm glad neither of us could deny how awesome we are together. The past week I've been cathing up with season 3 & 4 of Gossip Girl and I think it's kind of starting to reflect in the way I dress, haha. 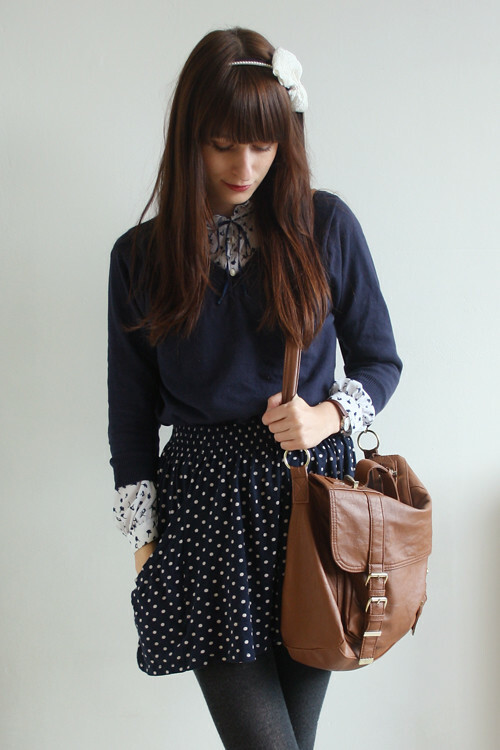 Ever since Gossip Girl started I've been in love with Blair Waldorf's preppy and girly style. I'd wear every single outfit she's worn on the show! Unfortunately she mostly wears McQueen, Marc Jacobs, Guiseppe Zanotti, Ralph Lauren etc etc etc. 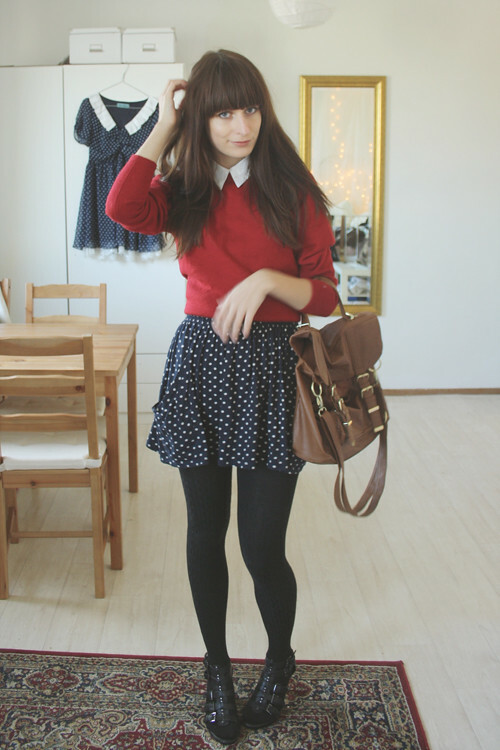 Until I magically get rich, I'm gonna have to do with a jumper, bag and bow headband from Primark, Zara skirt, Topshop shoes and a blouse from Outofastrobe vintage. Which works wonderfully for now. Ok, for once this is not just me being bitter cause I can't afford anything, honestly; I saw the H&M x Lanvin collection today and the quality is a joke. I don't understand why people are willing to pay 150€-200€ for stuff that's even lower quality than regular H&M. 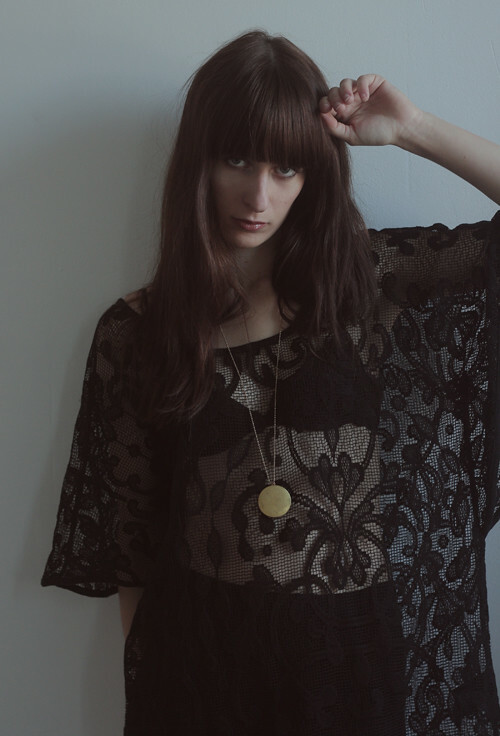 My lovely friend Kimberley just lauched the website for her shop Out of a Strobe Vintage. 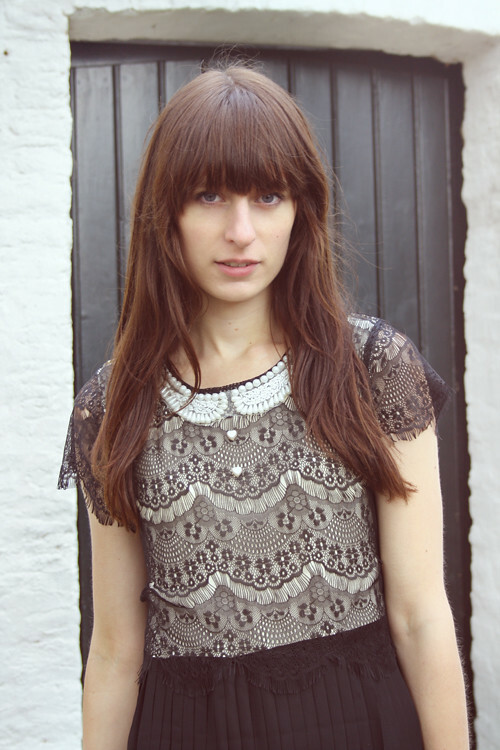 Having worked as a stylist for Topshop and several international magazines, she has such a great eye for style. Kindred spirits as we are, she is constantly looking for the most amazing vintage pieces, which she sells in her Etsy and eBay shops. 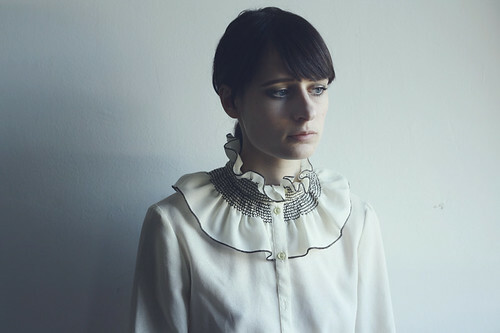 As for her new website, I am so in love with this amazing lookbook! To see more, visit the website. 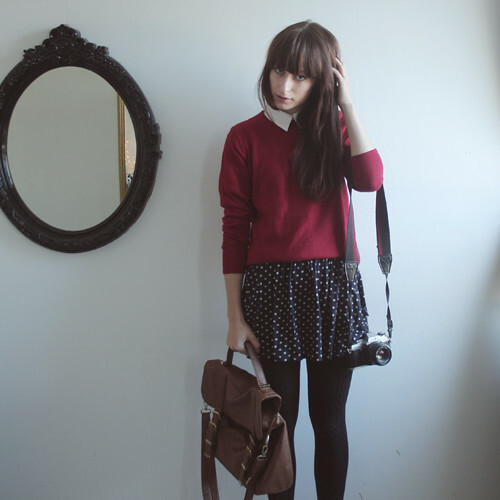 Vintage sweater :: Vero Moda blouse :: Zara skirt :: Primark satchel :: Graceland shoes. 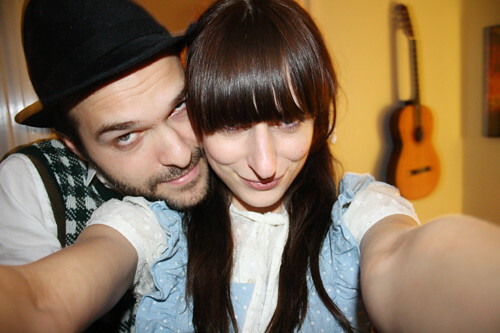 My brother and his girlfriend just came over for dinner and now I'm going out to see Seabear ♥. What did you do this weekend? Here are some more photos of my outfit. I'm trying to find new places in my apartment to take photos cause today it was far too sunny to take photos in my regular spot. And I feel like a tool going outside with all my stuff and taking photos of myself in public. 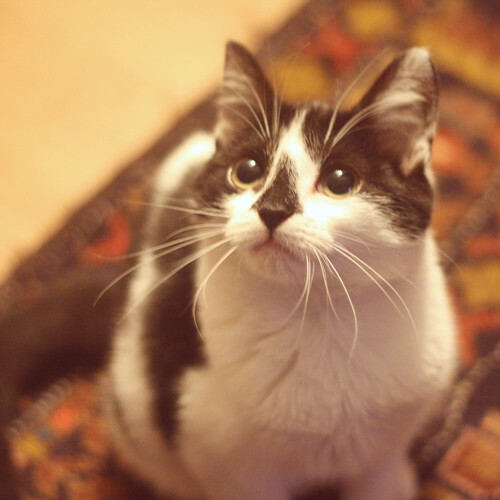 I need someone else to take my photos!! Whoops, today I was so busy watching Gossip Girl and altering dresses that I forgot to take blog pictures! 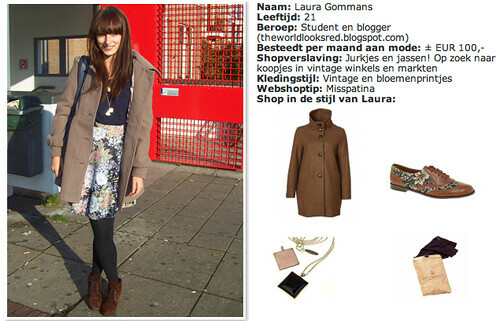 Instead I can show you that I've been featured on Fashionchick.nl in a streetstyle report. Which was sort of surprising cause I had been up since 5AM that day and I thought I looked horrible! 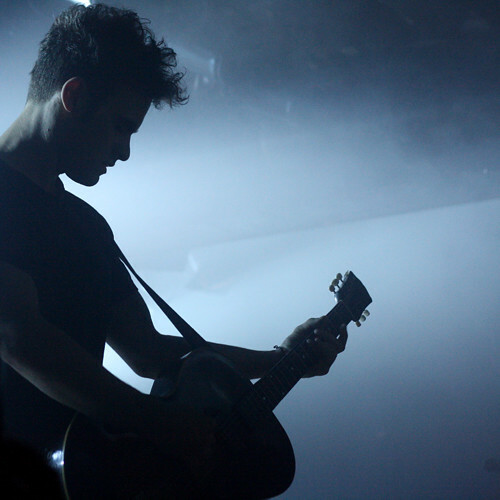 BRMC were brilliant, of course. They played in a really really small and cosy venue. 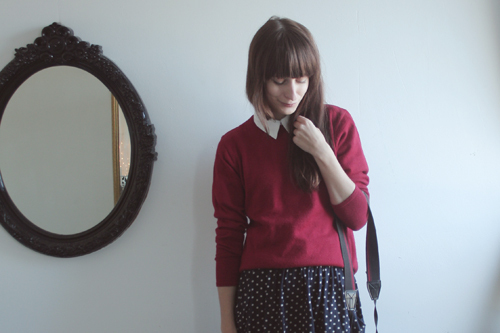 The days are getting a lot shorter and that certainly doesn't make it easier for me to take photos of my outfits. I have a few lovely collaborations coming up, though! -I did a guestpost on Kisses and Cross Stitches a little while ago. -Attention German, Austrian and Swiss readers: Daniel's band EF are heading out on tour in less than two weeks. Check out the Facebook event to see if they're anywhere near you! Sorry that im sucky at updating! Today i was home for 5 min after school to pick up a toothbrush and my camera and went to my brother in the south of holland where we're now waiting for one of my all-time favorite bands- Black Rebel Motorcycle Club- to start. Exciting! Hope to make up for it with some 'real posts' soon. Love!! 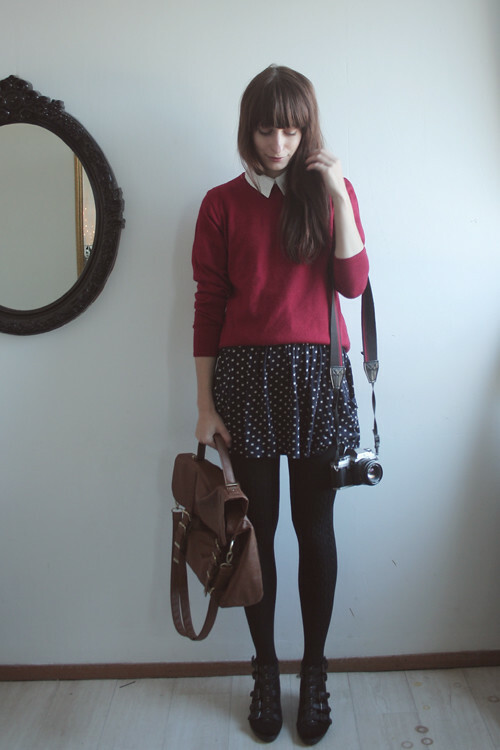 Just a quick photo of what I'm wearing today! The dress is from H&M. Daniel is here and we're going to town to see Sinterklaas now. Tomorrow Daniel has a job interview here! Fingers crossed! 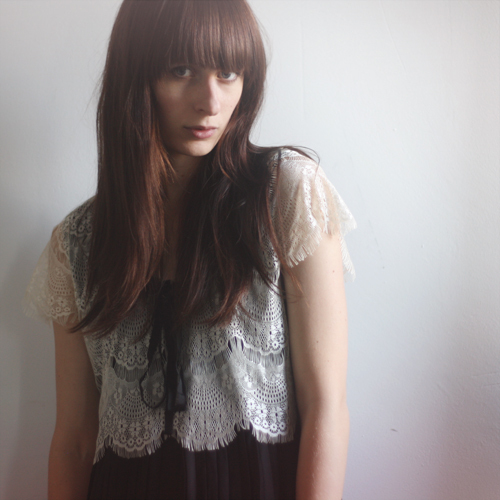 Here's a little preview of another dress I got from the lovely people at Miss Patina. 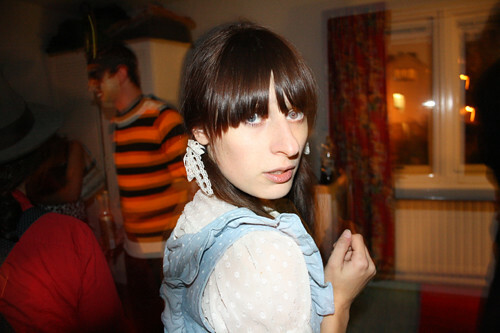 Today I met up with my friend Lisanne to talk about a jewelery-project she's been working on. It's really beautiful, I'm excited to show you soon! Song of the day: Coconut Records - Microphone. I like simple, cute and happy music. Bershka cardigan :: Primark blouse :: shorts and shoes from cheap multibrand boutiques. I'm still not feeling too great but at least I've gotten to a point where I want to get dressed again. Tonight I'm gonna stay in and watch movies. I sort of feel like I've already seen all the best movies in the world (to my very special taste at least) and I will probably end up watching I Love You, Man or Knocked Up or Forgetting Sarah Marshall or Anchorman or 40 Year Old Virgin for the billiongazillionth time. Anyway, does anyone have a suggestion for a great movie not starring Paul Rudd? I'm afraid my boyfriend will start to think I love Paul Rudd more than him. We don't have a New Look store here in Amsterdam, but the times I've been there in other cities, I have never really found anything. 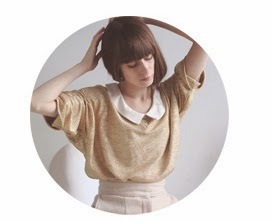 When I was browsing their webshop, however, I found tons of lovely things! Now I'm quite excited for them to open in Amsterdam. Does anyone know when? I've just heard rumours. I'm sick today. But luckily there's the second season of Bored to Death. I took this photo almost a year ago and I don't know why I never used it. I really wish I had the energy to be more creative again. I don't know where my time goes. I was featured with an interview on Keep The Good Work Going. I got pretty drunk yesterday so today was supposed to be hangover day, but I had to go to school for our magazine's launch-presentation, which was of course celebrated with MORE DRINKS. And then it gets dark so fast that I didn't have time for blogphotos. Tonight is going to be double-hangover-night starring Laura Gommans as Paul Rudd Fangirl. I've been getting some questions about my hair: how I style it, what products I use, etc. So I thought I'd do a hair-post! I made a little video to show you how I get some volume into my hair. As for products, I don't use that much. The most important thing is that your hair is healthy, so use a nice caring shampoo. I use Gliss with shea butter. I don't use conditioner that often cause it makes my hair heavy and it gets greasy faster. Instead I use a good hairtreatment once a week. I love Bonacure Amino Cell Rebuild (pictured left). After washing I blowdry my bangs and just blow though the rest not-so-thoroughly. I find it better to let the last bit dry naturally, so it doesn't get completely straight. 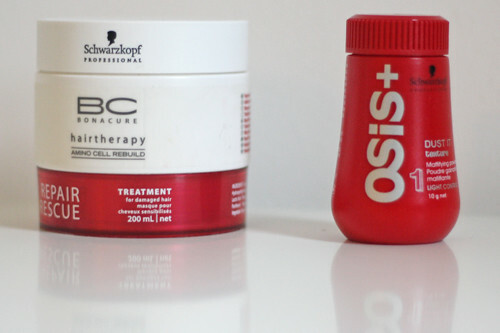 Then I put some Osis+ Dust It powder (pictured right) on the roots of my hair. Awesome product for volume! -Important: always comb your hair BEFORE showering. Your hair breaks about a million times easier when it's wet, so make sure you get all tangles out before you wash it! -I'm always quite reluctant to getting haircuts cause I'm afraid they'll cut off too much, but a while ago I got my hair cut into lots of layers and I find it so much easier to manage, now. Looks a ton healthier and it seems to be growing faster, too. -Most of the time I sleep with my hair in a bun to get some waves in there. Note that my hair is very thin and and smooth and straight, your hair might be completely different, so these products and tips might not work as well for you as they do for me. If you have any other questions regarding hair or anything else, you can ask me on Formspring or just leave a comment! 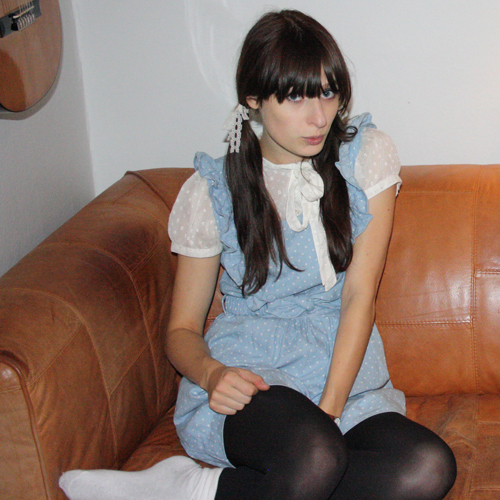 Here are a few pictures from Halloween, I was Dorothy in a Miss Patina dress and H&M blouse. Daniel was a gypsy beggar cause we didn't care to spend money on a costume, haha. He was wearing eyeliner!